Are you missing important emails because they keep going to the junk folder? Although 90% of the emails in your junk folder are probably genuinely “junk” or “spam“, the occasional important and genuine email will end up there. The reasons for this are numerous and include suspicious attachments, being on a spam blacklist and in many cases a poorly configured email server. 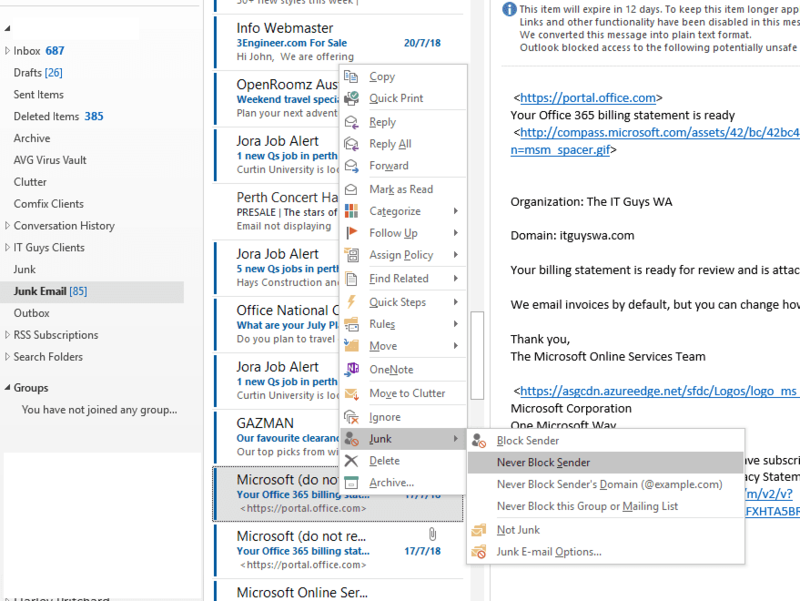 If you are running the latest version of Microsoft Office 365, Outlook (for Windows) provides a very easy way way to “trust” or “un-block” genuine email addresses. Find the email in your junk folder and click on it. Now with your mouse do a “right-click” and a menu appears (see picture above), select “Junk” and another sub menu appears. If the email is from an individual choose “Not Junk” or “Never Block Sender“, if the email is from a list or newsletter you subscribe to, select “Never Block this Group or Mailing List“. It’s as simple as that. Unfortunately earlier versions of Outlook, Mac Mail and Web Mail Clients are not as easy to configure.